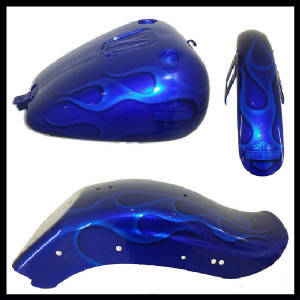 We provide OEM Harley-Davidson parts with flawless paint! 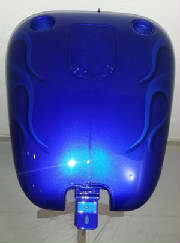 Do you need a Harley-Davidson gas tank and don't want to pay dealer prices and wait up to 14 months? 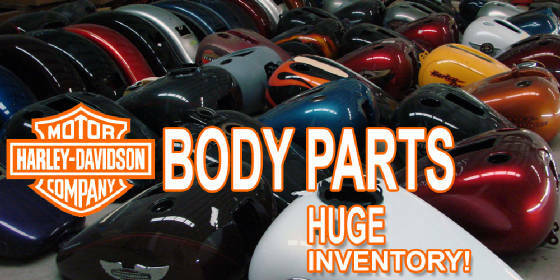 OUR OEM PARTS SHIP WITHIN 1-5 DAYS AND COST LESS! ON SALE $4450.00 (parts included). Fat Boy models FLSTFI from 2007-2010.
a very hard time beating this paint job in any bike show! 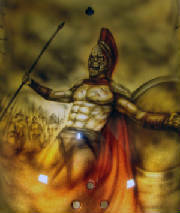 Paint job features several Spartan battle scenes all hand painted in highly detailed fine art. Candy apple metallic color combinations bring this art work to life under direct light. A very dramatic composition in 3D appearing imagery demands attention in any crowd. WILL GET "BEST IN PAINT" TROPHIES AT MOSTSHOW EVENTS. Many light reflections seen in photo! Paint job is flawless. Night Train models FXSTC, FXSTB (CARB & EFI) 1999 & 2000. Custom painted set ready to ship. Excellent choice for a bike with a lot of chrome. ON SALE $2495.00 (parts included). Custom painted set ready to ship. 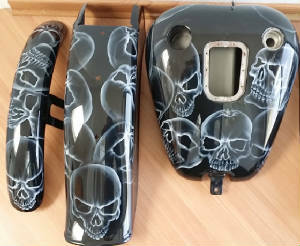 This set fits Harley-Davidson Softail Standard, Custom & Night Train FXST, FXSTC & FXSTB from 2001-2007 EFI models. 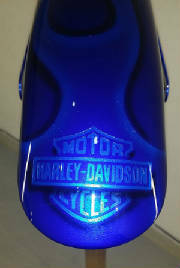 Paint job features candy cobalt blue metallic ghost flames and 3D appearing Bar & Shiepd logos on all parts. 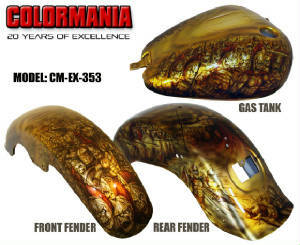 This paint job pops to life under direct light and gets your bike a ton of complimetns. In any crowd. It is elegant, highly detailed but not over the top. ON SALE $1795.00 (Gas Tank included). 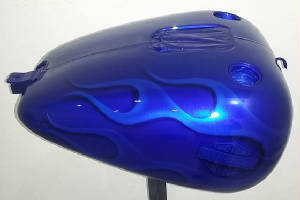 Custom painted gas tank ready to ship. 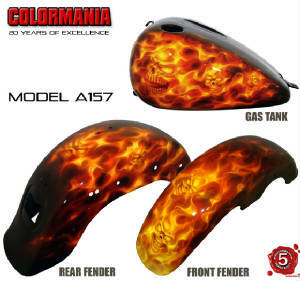 This gas tank is perfect for a bike that has Vivid black fenders already. 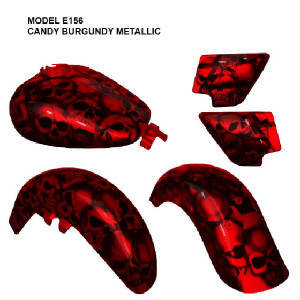 Fits Softail Standard, Custom & Night Train FXST, FXSTC & FXSTB from 2001-2007 EFI models. 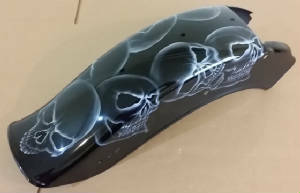 If you own a Night Train, keep the fenders black and transform your bike with this amazing gas tank while keeping the overall black look. 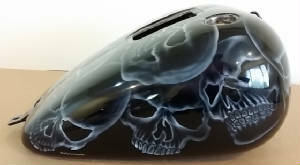 Paint job features classic flames with gold pin-striping and highly detailed airbrush art work of skulls. Each skull is unique and 3D appearing. ON SALE $1849.00 (parts included). FLSTCI from 2001 - 2007 EFI models. sides and a gold pin stripe line. 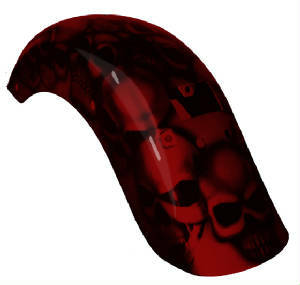 This is a classic design with a custom touch that is not over the top! ON SALE $3695.00 (parts included). Road King models FLHRI from 2007-2013 without any modifications. 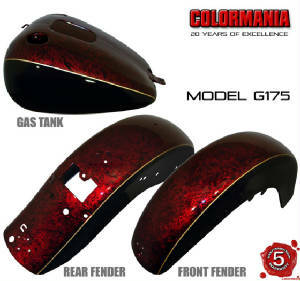 This highly detailed paint set transforms your bike into a show winner. Candy apple colors are used to create this art work and bring it to life under direct light. 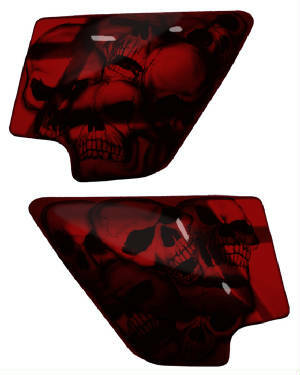 A very dramatic composition in 3D appearing skulls, demands attention in any crowd. ON SALE $2695.00 (parts included). 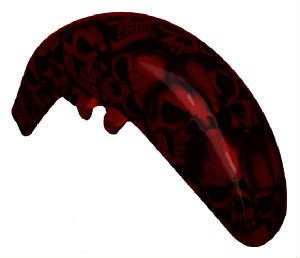 need to paint another rear fender for you within 3 weeks). winner. Other bikes will have a very hard time beating this paint job in any bike show! WILL GET "BEST IN PAINT" TROPHIES AT MANY EVENTS. 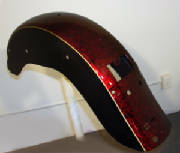 This model is in stock and fits Harley-Davidson Dyna Wide Glide FXDWG from 2006-2009. 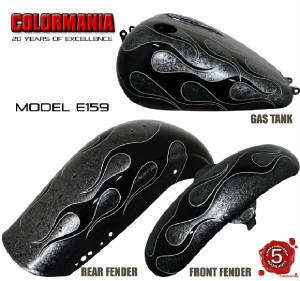 Paint job features 3D appearing black flames over silver metallic marblized base. Pin-striping is done in a light gray tone. Softail custom and Night Train. 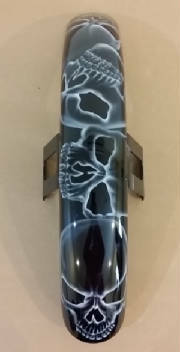 Paint job features 3D appearing black flames over a hand painted and airbrushed real fire background. 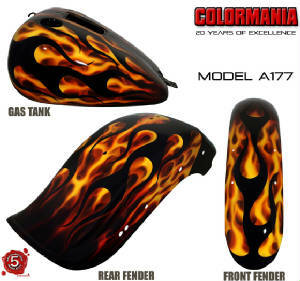 You have it both with this dramatic desing; flames and real fire. This paint job makes your bike stand out in any crowd.